Chris McAlinden (left), group operations director for Dale Farm, alongside farmer David Beggs, one of the Dale Farm cooperative members who supplies the company with milk from his farm nearby in Cookstown. Image: Dale Farm. What is thought to be the largest solar project purely for self-consumption on the island of Ireland has been brought online to power Dale Farm’s cheddar cheese plant in County Tyrone. 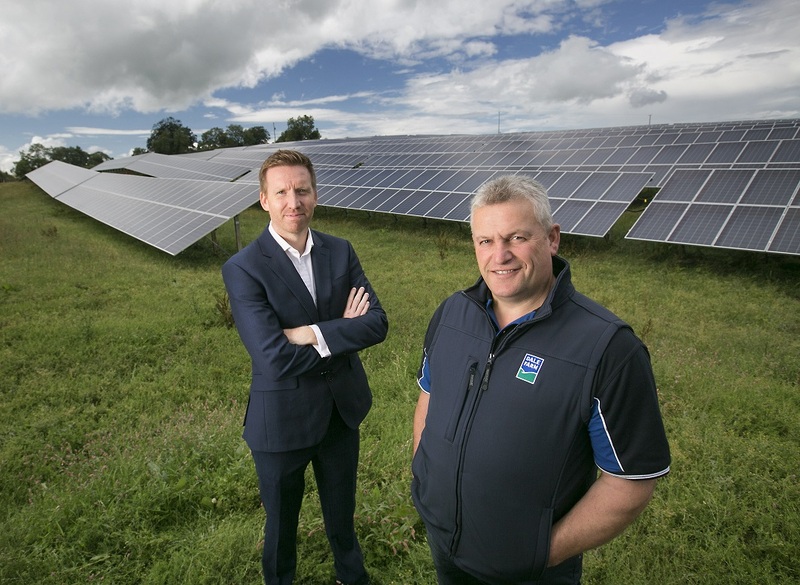 The Northern Ireland-based dairy cooperative began planning the 5MW solar farm in 2016 with developer CES Energy, which has now successfully connected the site directly to the network of its facility in at Dunmanbridge, Cookstown. The project, which guarantees 20 years of green energy for the company, is expected to reduce Dale Farm’s carbon footprint by 20% while delivering multimillion-pound savings in energy costs. Chris McAlinden, group operations director for the company, said: “Dale Farm is committed to leading the way in sustainability – with a strategy that sees us constantly assessing our processes and facilities to identify how we can reduce our carbon footprint and increase efficiency. “For companies like Dale Farm, maximising sustainability is key to leading the way in social responsibility,” added Tom Marren, chief executive of CES Energy. The project is considered to be the largest of its kind on the entire island after Lightsource completed a 4.83MW farm under a power purchase agreement with Belfast Airport in 2016.